Visual loop: "Seasonal wind prediction with Project Ukko"
Flowing Data: "Wind prediction and potential power"
Scientific American: "The Data, My Friend, Is Blowing in the Wind"
WIRED: "Project Ukko Is a Clever Way to Visualize the Complexities of Wind"
Creators Project: "Predict Winds to Come with a Climate Data Visualization Tool"
Huck Magazine: "Moritz Stefaner. The data visualisation artist playing with the future"
The natural environment and human health, infrastructure, food security, energy production and access to fresh water are all vulnerable to variations in climate, and this hazard will increase as climate changes. Access to credible seasonal forecasts has the potential to improve the resilience of society to climate variability and change. Climate change is discussed in terms of trends that can seem remote, but it takes place through weather events with real and immediate impact and increasing volatility. To be more able to deal with such variability means we are more able to cope with climate change. 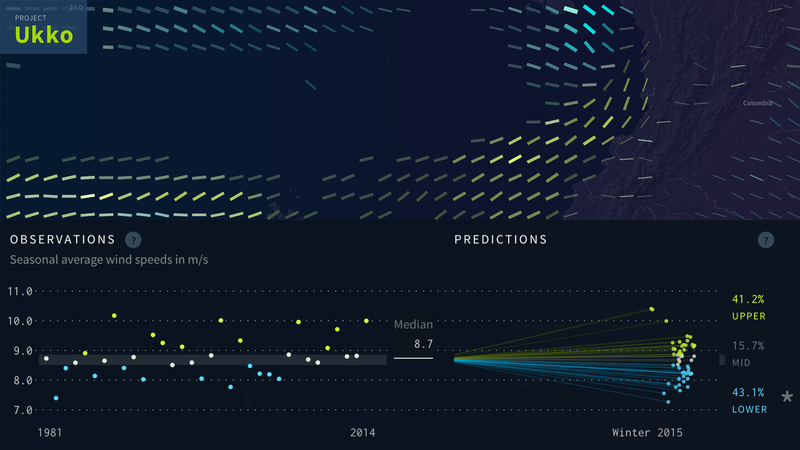 Project Ukko is an interactive climate service interface for wind industry users to explore probabilistic wind speed predictions for the coming season provided by the RESILIENCE prototype. The aim is to support users to better understand the future variability in wind power resources and bridge the gap between energy practitioners and the climate science community. Predicting the future variability of energy resources beyond the first two weeks can allow end users to take calculated, precautionary actions with potential cost savings. In the wind energy sector – for energy traders, wind farm managers and many others – it is crucial to understand wind conditions in the next few months. Climate services produce and apply climate knowledge and information for decision making in industry, policy and planning. The EUPORIAS project sets out to develop fully working prototypes of climate services that provide made-to-measure seasonal climate predictions, tailored to the specific requirements of different users and industries. Advances in climate science are creating an unprecedented potential to provide climate and weather forecasts for longer periods, over the coming months, seasons and decades. Current energy practices use an approach based on retrospective climatology. This methodology can be improved by probabilistic forecasts, that build upon recent advances in global climate models that simulate the physical processes that govern the whole climate system, at least at some spatial and temporal scales. The information displayed within Project Ukko is provided by the RESILIENCE prototype developed as part of EUPORIAS project. The prototype uses the ten-metre wind speed forecasts from the ECMWF System 4 (Molteni et al., 2011) operational seasonal prediction system. The prediction are validated with the surface wind speed data from ERA-Interim (Dee et al., 2011). The output of a seasonal forecast systems, as those of any other forecasting system, have to be systematically compared to a reference, preferably observations, to assess their overall quality in a multifaceted process known as forecast quality assessment (Mason and Stephenson, 2008). This is another crucial step into the prediction process because a prediction has no value without an estimate of forecasting skill based on past performance (Doblas-Reyes et al., 2013). The RESILIENCE prototype uses the ten-metre wind speed forecasts from the ECMWF System 4 (Molteni et al., 2011) operational seasonal prediction system, which is based on a fully coupled global climate model. Atmospheric computations are highly sensitive to small variations in initial conditions, which can produce very different final outcomes. Furthermore, our knowledge of initial conditions is always imperfect, as observations are discontinuous. This is why ensemble predictions are used to estimate the multiple possible evolutions of the atmosphere-ocean system, and the probabilities associated with them.For this reason, the operational System 4 (S4) forecasts are produced at the beginning of each month with 51 ensemble members. Each member of the ensemble uses slightly different initial conditions and different realizations of stochastic representations of subgrid physical processes in the atmosphere. The simulations are performed for up to seven months into the future. To evaluate the S4 prediction quality, we compare the predicted ten-metre wind speed with the corresponding variable of the ERA-Interim reanalysis (Dee et al., 2011). This reanalysis uses the ECMWF Integrated Forecast System (IFS) atmospheric model that assimilates observational data of many types, including in-situ observations and satellite measurements. Given the sparsity of global wind observations, we used a reanalysis as the best available estimate of wind speed and temperature. Like every variable predicted in a coupled model, wind speed is affected by biases resulting from the inability to perfectly numerically reproduce all the relevant processes responsible for climate variability. System 4 seasonal predictions require a post-processing stage for them to statistically resemble the observational reference and minimise forecast errors. The RESILIENCE prototype performs this fundamental step to produce usable, tailored and high quality information using the Calibration method. Calibration can be considered as a way of obtaining predictions with average statistical properties similar to those of a reference data set. For such purpose, we have applied the variance inflation technique (von Storch, 1999). This modifies the predictions to have the same interannual variance as the reference dataset and corrects the underestimation or overestimation of the ensemble spread without modifying the ensemble-mean correlation. The statistical post-processing parameters are determined by comparing the past forecasts with the observations which are based on the same dataset that is used for verification. The cross-validation estimates the corrected forecast by omitting the particular forecast to be corrected from the forecast average, i.e. all the available samples but the target season are used as training data, including years after the target season. This procedure is useful to emulate real-time forecast situations as closely as possible. Seasonal forecast systems, as any other forecast, have to be systematically compared to a reference, preferably observations, to assess their overall quality in a multifaceted process known as forecast quality assessment (Mason and Stephenson, 2008). This is a fundamental step in the prediction process because a prediction has no value without an estimate of its quality based on past performance (Doblas-Reyes et al., 2013). The three scoring measures used in the RESILIENCE prototype are the ranked probability skill score, the reliability diagram and the rank histogram. They consider probabilistic or ensemble forecasts so that the forecast uncertainty is fully taken into account. The goal is to offer the most general and, a priori, relevant information for a user in the wind energy sector instead of the traditional view offered by climate scientists where only the ensemble-mean correlation is shown. The skill estimates, based on the performance of the system in the past, inform users about the expected performance of future forecasts (Weisheimer and Palmer, 2014). A particular measure of the predictive skill for the probabilistic seasonal forecast for categorical events is the ranked probability skill score (RPSS) (Epstein, 1969; Wilks, 2011) which is a squared measure comparing the cumulative probabilities of categorical forecast and observation vectors relative to a climatological forecast strategy. The RPSS is based on the ranked probability score (RPS), which is a measure of the squared distance between the forecast and the observed cumulative probabilities. In the present case, the RPSS has been computed based on categorical forecasts for terciles. The individual observations in the verification time series can fall in any of the three categories with probability determined by the probability density function (PDF) for the target season. The RPSS and CRPSS range from 1 (for perfect predictions) to −∞. Skill scores below 0 are defined as unskilful, those equal to 0 are equal to the climatology forecast, and anything above 0 is an improvement upon climatology, up to 1, which indicates a ‘‘perfect’’ forecast. Project Ukko is designed for energy users, in particular for wind farm managers and energy traders, who need to understand how wind will change in the coming months. The web application at http://project-ukko.net allows to spot global patterns and trends in future wind conditions, and drill into detailed prediction breakdowns on a regional level. The user interface presents a thematic map with wind prediction data visualized in line symbols (multi-dimensional glyphs) for around 100,000 regions of the world. Prediction skill (i.e., how well the prediction model performed on historic data in that region) is expressed through opacity. Regions with higher skill values are more opaque, regions with lower values more transparent. in order to facilitate readability, the opacity values are binned into 4 discrete steps based on the quartiles of the skill distribution. Only lines that represent areas with skillful forecasts are visible at all. 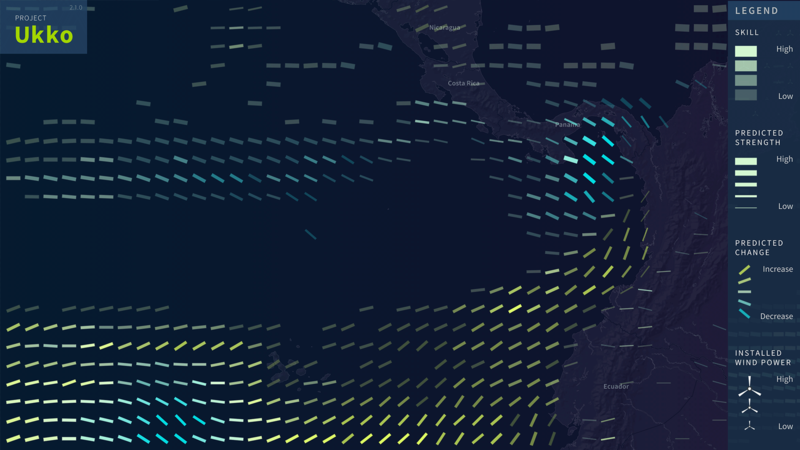 Predicted wind speed is encoded through line thickness. The line strength is directly proportional to the median predicted wind speed. Predicted trend category of wind speed in line tilt and color. Yellow lines pointing to the top right indicate a high probability of increased winds, blue lines pointing bottom right, a high probability of reduced winds. Encoding trend in line tilt and color (a so-called redundant encoding) has the benefit that in zoomed out view, the colors provide a good overview of the trend situation, while in closer views, the tilt is readable more precisely. In addition, the available wind power production capacities can be visualized on the map, in order to compare future wind conditions with the presence of wind farms. Turbine icons of varying size show the location of wind farms and the overall installed power facilities according to the database provided by thewindpower.net. Observations plot The observations plot summarises the mean wind speed observations in the selected geographic region over the last 30 years, in the respective season. Each observation is color coded and split into three categories of equal size (terciles) that indicate if that year had low(blue), medium(grey) or high(yellow) wind speeds. Prediction plot This diagram presents the predicted values of the 51 ensemble members obtained by the RESILIENCE prototype. These values comprise the calibrated probabilistic prediction for the selected region. The ensemble predictions are displayed as a cone of rays emanating from the typical (median) value of the historic data, allowing a quick judgement of variance among the predictions, and the central tendency. Skill Skill is also numerically represented in the chart as a percentage.. A (hypothetical) score of 100% would indicate a perfect prediction and a score of 0% would indicate that the prediction is no better than just making a guess based on historic data. Installed Wind Power A chart shows the installed power in the selected region according to the database provided by windpower.net. Project Ukko director Drew Hemment. Wind power capacity data was generously provided by thewindpower.net. EUPORIAS is a project funded by the EU 7th Framework Programme (GA 308291) and led by the Met Office.